Richard A. Lee, a 59-year-old Palm Coast resident who was cycling Sunday evening, was struck by a car at the intersection of Palm Coast Parkway and Boulder Rock Drive just before 7 p.m. Lee, a resident of the B-Section, later died en route to a hospital. Lee had started to cross the parkway from the northwest corner of the intersection. 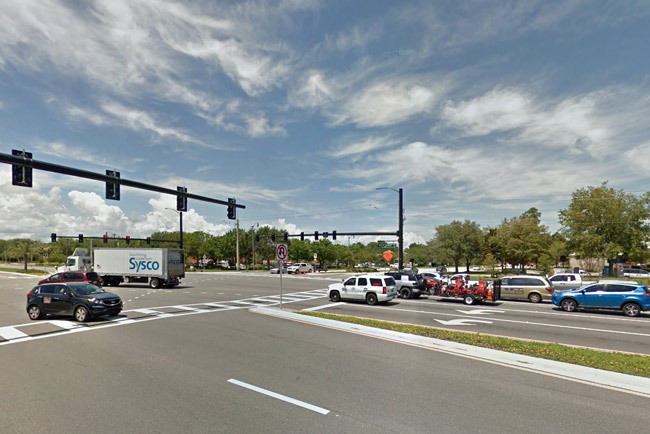 “Apparently the man was crossing where the crosswalk is to go toward Walmart, and got hit,” a Florida Highway Patrol investigator said. Nicholas Malkowski, 17, of Palm Coast, was at the wheel of a Dodge Nitro, driving west on Palm Coast Parkway. He had a green light, according to a witness who spoke with authorities. Lee violated his right of way, the investigator said. Malkowski, a student at Flagler Palm Coast High School, was going home on his way back from work at a restaurant in Flagler Beach. Based on a preliminary investigation, Lee was not wearing a helmet. A responding rescue unit performed CPR at the scene. Flagler County’s FireFlight, the county’s emergency helicopter, was not in service. (It’s usually in service every day between 8 a.m. and 8 p.m., but Sunday night the pilot on duty had to attend to personal business, Flagler County’s fire chief, Don Petito, said. “That happens occasionally,” he said, noting that the county has only two pilots.) St. Johns County’s Trauma One was called in, but it, too, was out of service. At that point Volusia County’s Air One was called in, then cancelled when Lee went into cardiac arrest. Lee was stabilized and taken to Florida Hospital Flagler, where a doctor ordered the patient taken to the trauma unit at Halifax hospital in Daytona Beach, Petito said. “En route to Halifax, the patient coded again so they diverted to the closest facility, which was Ormond.” Code blue is when a patient goes into full cardiac arrest. The patient was then pronounced dead at Ormond Memorial hospital. The scene of the crash itself was very quickly cleared, however: the crash took place a few minutes before 7 p.m. By 7:45 p.m., all responding units had left. The Flagler County Sheriff’s Office, the Florida Highway Patrol, Flagler County Fire Rescue and the Palm Coast Fire Department had responded, as had the Palm Coast Fire Police. But it was only after the victim had died that FHP sent a homicide investigator to the scene, by which time the bicycle had been removed by a wrecker, and the driver of the car had been allowed to return home. Crash scenes involving critical or fatal injuries are usually roped off and meticulously analyzed for several hours by crash-scene investigators. The Florida Highway Patrol, however, which handles such investigations, has been significantly short-handed, so traffic homicide investigators are called in only after a fatality has been confirmed. In the past, a traffic homicide investigator would be dispatched even in critical cases, right away, in case the patient were to die subsequently, thus ensuring a thorough investigation either way. In this case, the confirmation of the patient’s death came in just as the scene was being cleared. The initial report of the crash from Flagler County’s 911 center was recorded at 6:51 p.m., according to dispatch records. (Malkowski himself called 911 and said he’d not seen the cyclist and had struck him by accident.) CPR was in progress at 6:56 p.m. When paramedics arrived on scene, they reported that the victim was not breathing. Trauma One was reported out of service at 6:58. Air One launched from Volusia at 7:04 p.m. and cancelled at 7:12, when the order was to transport the patient by ground to Florida Hospital Flagler. At 7:32 p.m., dispatch notes indicate the patient was sent to Halifax hospital. The crash scene was declared ended at 7:46 p.m. At 7:48 p.m., the hospital destination was changed to Memorial Hospital in Ormond Beach. That was when the patient had gone into cardiac arrest. “Death notification” was made from the dispatch center to FHP at 9:03 p.m. The victim’s next of kin is out of state, and had not yet been contacted by Monday morning. The fatality is the second in four days on Palm Coast roads: a 16-year-old high school student was killed and a 21-year-old friend injured as the pair, walking along Lakeview Boulevard the evening of March 2, was struck by a car. Richard A. Lee, a 59-year-old cyclist, was killed in a collision with a car while crossing Palm Coast Parkway Sunday night, though Parkway traffic had the green light. OK, here we go again. Another avoidable death has taken place in Palm Coast. When will pedestrians and bicyclists figure out what THEIR responsibilities are while walking, running, biking around the streets and roadways anywhere in this country? So here is an intersection with plenty of street lights, well marked crosswalks and sidewalks and still someone dies from being hit by a vehicle. And this 17 year old innocent driver has to live with this on his conscience everyday for the rest of his life. What a preventable tragedy. So sad, my heart goes out to the young man because the old man did not pay attention. Very sorry for all involved and even more sorry that this cyclist could possibly have had a better chance of survival if the county had it’s FireFlight pilot ready to roll…..I cannot understand if a pilot is ‘on duty’ but not available because he/she had to attend to personal business, then why was there not the other pilot covering? How can one be ‘ON DUTY’ if you’re not there? St. John’s helicopter was out of service as well? Where is everybody? And of course Fl. Hospital Flagler can’t handle much more than an earache so let’s take him/her all they way to Halifax and end up in Ormond! What a mess. I agree. It is such a tragedy for both. Bicyclists need to understand the roads were built for vehicles. Everyday when i am enroute to work, i am going around bicyclists endandering myself. Motorists, bicyclists, walkers, runners should NOT be sharing the same space. We all need to ride, drive by the rules and take better care… I always assume that somebody is in my blind spot before making a move. Always look for people, pets, bikes and cars. It will save lives and keep you from a terrible accident. C, if you knew about roads, you would know that a bicycle is considered a vehicle, and it is actually agains the law for them to travel on the sidewalks. Bicycles should be cautious, yes, but the only places I’m seeing the runners, people walking in the road, and bicycles, are in neighborhoods where you should be going no more than 20mph, wait for clear roads, and pass the pedestrian/cyclist with enough space to do so safely. It’s not endangering you for a cyclist to be on the road so long as both you and the cyclist are understanding the rules of the road. I have to ride my bike to work and school a lot, and I refuse to ride on palm coast parkway for exactly that reason, people don’t even yield for pedestrians crossing the road on crosswalks properly (i.e. when they’re instructed to go by the sign, and all traffic has stopped. I think the real lesson that needs to be learned here Is that everyone needs to be more defensive when driving and aware of their surroundings when traveling as a pedestrian or cyclist. According to Florida Traffic Law, a bicycle is considered a motor vehicle and must abide to traffic laws. I don’t uderstand why people don’t understand or know this. Bicycles are Motor Vehicles !! Okay, I think it’s about time this community has some free to the public pedestrian, driving and bike riding refresher classes. So sad that this poor kid has to live with this the rest of his life. He had a green light, I am assuming he was doing the speed limit. The guy on the bike made a mistake. I had a guy on a bike pull out right in front of me last month while I was driving to Epic Theater with my Mom. I had a clear road, no stop sign..the guy was on a bike path that crossed the road and just biked right across the road in front of me. I couldn’t believe it. Luckily, I was able to brake and avoid hitting him. And, then he stared me down like I had done something wrong. I AGREE WITH YOU ”C””. I RIDE A BICYCLE FROM TIME TO TIME, BUT I ALWAYS RESPECT A CAR/TRUCK. ANY WALKER, RUNNER, CYCLIST, OR WHATEVER…….KNOW THIS, THAT REGARDLESS OF THE TRAFFIC LAWS, YOU WILL LOSE WHEN A VEHICLE MAKES CONTACT WITH YOU, POINT BLANK, LETS BE MORE COGNIZANCE AND THATS IT. Roads were made to travel on and the first travel was on foot in the dirt. Then horses and bicycles were making roads. Then came motorcycles and auto’s, but most important thing is to be nice. Driving is a privilege and makes life easier. Control your auto or have the keys taken away for a little while if you hit someone or something. The roads are there for walkers and bicycles and auto’s just be nice to the others on the road. People are just in to big of a hurry in today’s world. This is happening to much and hope the young man is doing well. What is happening in this world ? 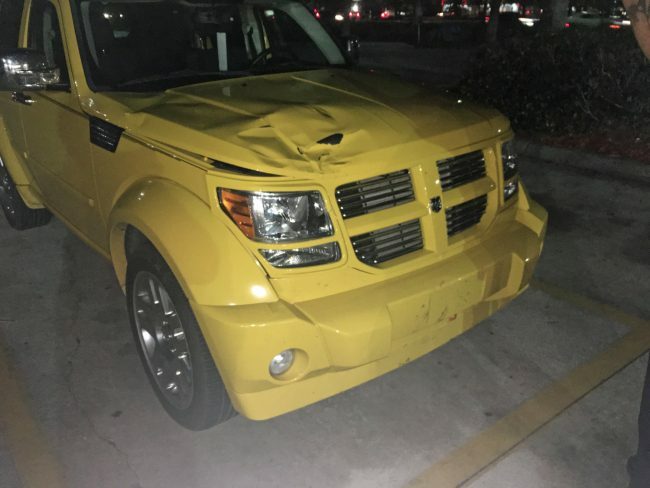 Last two days I have read the comments about these accidents, and I read they shouldn’t be walking there when it is dark, he was not paying attention, he was an old man (59) she may have been speeding, he should of paid more attention…yikes ! how about ? can we get an address to send a meal over for the family, families.. Is there a fund that I can contribute too ? I will light a candle at church for them..where can I volunteer to make our streets safer ? anything is better than reading comments from opinionated fools that were not even there to witness what happened ..Cmon people, I am losing faith in the human race ! Bkers ARE considered vehicles. Most car drivers do not know that. Pickups in particular are usually the most aggressive. I rode for many years. Even when there are bike paths, they are still considered vehicles. I have heard of people dying when they get hit by a bike on a sidewalk. Consider a 200 pound biker do 20-30 miles an hour hitting you. Sadly, the driver will forever remember this tragic accident. Hopefully someone will step-up and make sure this young man gets counseling. Cyclists are bound by the same traffic laws as motor vehicles in Florida. But they routinely flaunt those laws, either by intention or ignorance. This cyclist paid the ultimate price. Condolences to their family. While I do agree that runners and walkers should keep off the road, keep in mind that depending on circumstance not only are bicycles considered vehicles, but the road is the safest place for them to be. Not saying this cyclist wasn’t in the wrong, but there are times when cyclists can & should be on the road. How tragic! It seems as though this poor cyclist fell through all the cracks and none of the emergency systems were in place to save him. That has always been an extremely hazardous intersection for cyclists to cross and even more so now that Palm Coast Pkwy was widened. @ old lady – 59 is not that old. @ C – Cyclists are by law considered traffic. They usually hug the edge of the roads but legally can ride anywhere in their lane (even inches from the yellow line) as long as they’re riding in the direction of the traffic flow. Vehicles must maintain a 3′ distance from them when passing. My husband & I are cyclists, also. I will say that the traffic light timing is partly to blame. The pedestrian/cyclist signal to cross the road is timed to indicate you can cross at the same time that the light turns green for the turn lanes. This is very dangerous since most motorists never even glance at the pedestrian signal. Sad to hear of another avoidable fatality in Palm Coast. Just the other day I was 3 cars behind the light coming off of Boulder Rock and turning left onto Palm Coast Pkwy. I witnessed a bicycle rider who clearly did not have the right away ride completely across the crosswalk and nearly got hit for his effort. Whether you are a cyclist or a pedestrian the rules of the road apply to you as well. Don’t just assume you have the automatic right away when crossing the street. When crossing with a bike dismount and walk across the cross walk in compliance with the signal. Looking both ways and paying attention will drastically increase your chance of making it alive. I feel for the family that lost their loved one as well as for the 17 year old driver. Tough day for all involved. Nearly every cyclist I see on my drive though town violates traffic laws. I can’t tell you how many of them come out of no where and try crossing the road illegally. There really should be a license to bike where people need to take a bike movement test and a written test, especially if they are going to be on the road with cars, and they should be ticketed if they are seen violating the traffic laws. Seems only fair since many refuse to follow the law. So sorry to hear. We drove by heading east shortly after 7 and paramedics and first responders were on scene. My family said prayers for the bicyclist and also for all the first responders. We send our prayers up for everyone involved. Very sad. While I was in Palm Coast, I rode my bike around the area and was nearly hit by absolutely reckless, inconsiderate drivers nearly every day. Many turn right into crosswalks while pedestrians and bicyclists are trying to cross. I had one woman shake her fist at me then flip me off for daring to delay her. I had the right of way, but that doesn’t matter in FL. Everybody’s in a big hurry to go nowhere important. So, when some say bikers don’t observe the ‘rules of the road; some may not. But I did. Still, I was nearly killed three times by idiots that shouldn’t have a licence. National statistics point to Florida as the worst when it comes to deaths regarding cyclists hit by cars. Ten times that of any other state. You think laws would be passed and drivers would be more cautious. But, it appears to be easier to make excuses and blame those of us that ride bikes than to take personal responsibility for what is a real tragedy for the families of the many victims of reckless driving. @ UGH – Not true! Here is the link to the Florida Statute on laws for bicycles. Bicycles ARE allowed on sidewalks and crosswalks and when doing so they must abide to the same rules & regulations as pedestrians. @ Live Long & Prosper – I totally agree! It would benefit not only the number of misinformed people posting here but also people in our community. However, the next task is to get them to show up. Most think they already know it all. @ UltraViolet – the dead biker was crossing in a crosswalk against a red light when he got hit. The biker who pulled out in front of you will not live very long either if he continuous to break motor vehicle laws. He will end up just another statistic with people wondering why did he have to die. Trust me, like RAS states the car will always win when riding a bike and that goes for motorcycles too. Based on Concerned Citizen’s post above, there will be many more bike fatalities not only at that intersection but all over Palm Coast. Either there is something wrong with the water or people have lost any and all common sense. By the way, you can’t teach common sense to people. Doyle Lewis… you are exactly right. People should notice that most all roads now are being made with bike lanes. Bikes are allowed on the roads. People are allowed on the roads. Like many said, drivers are just in too much of a hurry and too distracted by cell phones. NOT always of course and maybe not here. The key to remember is everyone is human, cyclists, pedestrians, & drivers… EVERYONE. And accidents will happen unfortunately. However what is of concern is the hostility and rage that is on the streets, and you can see it right here in many peoples comments, they are angry and aggressive and it shows on the roads. You are absolutely wrong if you thing you are not supposed to make way for a cyclist or pedestrian, wrong, wrong, wrong.Everyone needs to follow the laws, cyclists, walkers, and every driver to ensure safety. Have a little patience and chill out and be careful, everyone, whether you are on a bike, walking or driving a car. Maybe you should also take a moment to reflect on why these people are walking or cycling; some are doing for health (which more of us should do), some are doing it for the environment (thankfully), and some are doing it out of necessity to get from A to B and it is their only option for transportation (kudos to them for not sitting home). Everyone just be considerate of each other or things will just keep getting worse. Be the change you want to see. “C” wrote the the roads are built for cars and that she feels endangered. I see other comments have informed her that she is completely wrong. First the law says cyclists and cars must share the road and a car must slow down and safely go around a cyclists. If you don’t like it, leave this cycling community. Also your in a steel cage, you are not endangered. Sidewalk are for walkers, roads are for cars and bicycles. We must all safely share this space. Get off your phone and concentrate on reaching your destination. If your in your car, going from 30 to 10 mph for 10 seconds to safely avoid a law abiding cyclists, will not make you late. Watch for bikers! I feel so bad for this kid and what he is and will have to live with on the death of this man. all too many walkers and bike riders do NOT follow the rules of the road. Yes so do auto drivers but walking and bike riding you are more risk of death from your own stupidity. Also for the most part we do NOT have “side Walks” in PC we have multi use paths. bikes, walkers, runners all can use them what is NOT allowed is motorized vehicles although I see them on them often. People with small gas scooters use them as they probably have NO valid drivers license. Palm Coast likes to promote itself as having lots of sidewalks and trails for people to walk and cycle. Perhaps it’s time to also cite accident statistics for people who walk and cycle. Some drivers don’t pay attention to anything but their phones. I cannot tell you how many times I have almost been hit by drivers who overrun the stop sign or traffic signal while on their phones. Anyone who thinks 59 is old must be a teenager. And if we’re old and expendable, then maybe we should stop paying taxes or move somewhere else where it won’t be open season on us. And really, people. Some freakin’ sympathy for a dead 59 year-old. The driver of a vehicle is responsible for that vehicle. its the cyclists fault and he most likely wasnt texting because the cyclist went while the car had a green light the dude on the bike is at fault. This is a tragedy for all those involved. As an active cyclist in the Palm Coast area I can say that most drivers are not good with obeying the rules of sharing the road, that said if the information in the article is correct this is completely the cyclist fault. Riding a bike does not give you the right to run red lights or go against cross walks. There needs to be better education all around, most of the closest calls I have had while riding were one the side walk as cars ignore the white line they are supposed to stop at and instead pull right through the cross walk and if turning right they never look right to see if anyone is on the sidewalk. Also if cyclist are on the road you are required to give a minimum of 3 feet from the widest part of your vehicle when passing. Everyone drivers and cyclist need to put their phones down and pay more attention. I see this happen all the time here in Palm Coast. For a while I kept seeing an older gentleman that would knowingly ride his bicycle into traffic, and hold up his hand in the intersection and try to force people to stop. And he wasn’t the only one I witnessed doing this. The person who deserves the sympathy in this situation is the 17 year old driver that has to live the rest of his life knowing he killed someone. He did nothing wrong, the cyclist ran a red light. Period. End of Story. If this 59 year old had been in a car instead of on a bike and done the same exact thing, nobody would be blaming the kid. So in other words if you get into an accident and need air rescue you can only get into an accident between 8am and 8 pm that is insane. Never heard of anything so ridiculous.